When we started in Fort Lauderdale back in November, I viewed those boats with huge tenders equipped with massive engines hanging on their davits as having something vaguely wrong with them. You have a sailing yacht. The operative word is “sailing”. Why would you need some whizz bang rubber boat? Just a bit of showing off really, isn’t it? A few months on, I now see exactly where their owners are coming from. Around Scotland, the UK South Coast and all the places I have sailed before, the wee rubber dinghy with a 2 or 3.5hp engine is enough as you trail over to the pub from that nice anchorage just off. Puilladobhrain springs to mind just S of Oban in Scotland (if you haven’t been there – google it – beautiful). A lot of the time you can tie alongside, sit close to civilisation on a mooring or maybe that nice water taxi will come and pick you up for you night time libations. Even Tobermory had that, at least for Army yachts as the harbour master there was an ex Gosport man and he liked to catch up on the chat. Here we anchor pretty much every night………. So let’s look at my fine dinghy. 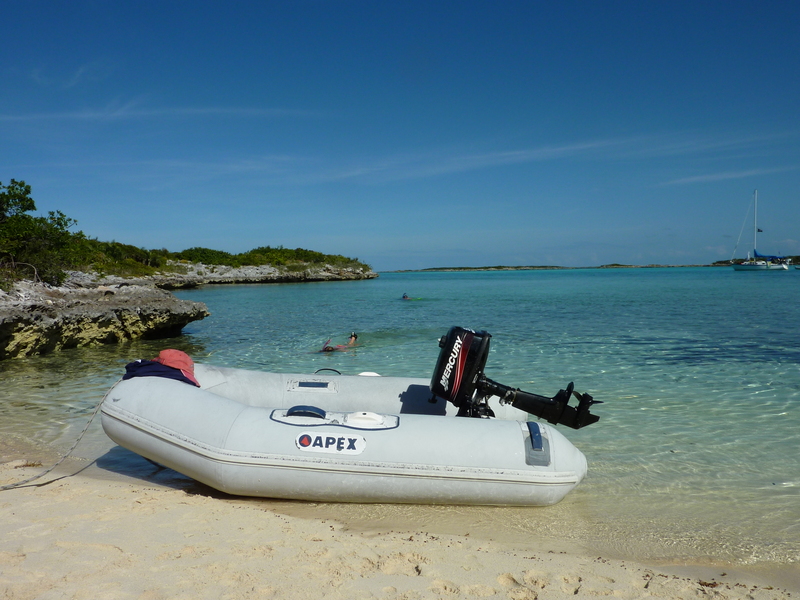 An 8 ft hard bottomed inflatable APEX dinghy with our new 5hp engine. A bit beaten up, a bit heavy compared with newer types and old, patched so much so it probably wouldn’t be looked at as a targeted steal, but functional. Good enough for the four of us and room for the odd bag too. I was pretty happy when I bought the 5hp in Nassau. Bigger than most dinghies have back in the UK and I got a good deal on it too. Perfect, thought I. The Caribbean is not like any other sailing area I have been to. Come to the Caribbean and you suddenly find that the places you anchor can be a long, long way from where you need to land at. And as we have moved down the Bahamas, we have seen longer and longer rides. Take our last stop at Georgetown and Elizabeth Harbour. The anchorage is over 3 miles long and as most boats anchor on the East side of the bay, it leaves you over a mile to get to Georgetown itself. Takes a while to travel that distance at a walking pace which is the best I can do with all of us in it. That is, as long as the current isn’t against you which is when you suddenly realise that you are moving backwards…. You also need to take into account that constant wind thing here. It is rare that there isn’t 15-20 knots with the associated fetch around, night or day and as we go further South into the Caribbean, the Trade winds will grow. No big deal if you are going across a sheltered UK anchorage. Sheltered here can mean an anchorage with a 3 ft fetch which is short and sharp. Bit different. It has been a bit cheeky sometimes just getting in to the dinghy. I’ve also needed a change of perspective as well. No longer am I a weekend sailor happy with the safe anchorages and moorings with the pub close by. We are liveaboards and we go to the middle of nowhere on a regular basis, just because we can. We have quickly realised that as liveaboards, the dinghy is your workhorse. It allows you to travel away from the often limited safe anchorage sites to interesting islands close by, to trawl safely in the windward deep water at the edge of the reef when you have folk snorkelling and spearfishing and to carry those spare water/fuel cans you need filled (trust me two or three 6 gallon cans weigh a lot) in to harbour. And you need to do this safely and quickly to cover the distances you often need to do. 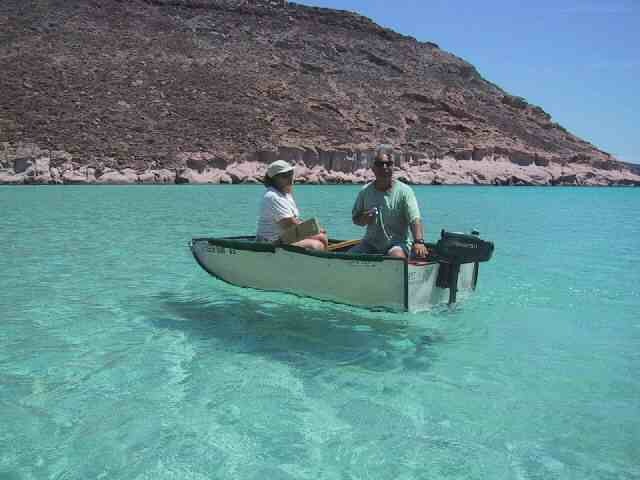 An appropriately sized and powered dinghy really is a necessity, not a luxury. So what is the typical dinghy here? From what we have seen (and we have seen hundreds) it is 10-12ft long, inflatable but with a hard bottom, needed because of the risk of coral ripping the bottom and so it can lifted to davits. Power wise the average engine is around the 15hp mark. You very rarely see less than 10hp but 20hp is common too. This combination gives you enough power to get on the plane with 4 adults on board (ie us, the kids and associated junk that goes with us) and enough length to bridge the short seas and travel safely at speed. The most spectacular tender we have seen was at Big Majors Spot, where someone had a 36 foot catamaran and had a 21ft tender, centre cockpit and bimini, with a 50hp on the back, dragged between the hulls on a home made harness. The only person we have seen with a smaller dinghy than us is our mate Igor, who has a sailing dinghy. But he sensibly hitches lifts if he is going anywhere far and you have seen photos of us pulling him back to his boat through some hard current he couldn’t row through. Strangely, he too is on the look out for an “upgrade”. Back to our reality. Our normal speed is that of a fast walking pace with all of us on board as the engine just isn’t strong enough to get us on the plane. I can’t do anything about the splashes from the short chop or the associated abuse from Lou for “parking too far away” as she gets another bucket of water over her (sorry, love – it really isn’t deliberate) as we are too short to do anything other than go up and down over each and every wave. And I have to suffer the indignity of having friends coming back to take some of my load so we can get on quicker to our destination. A 3 minute journey for them = 15mins for me. Taia, ( 2 adults and 5 kids on board) bless them, came back to whizz past me three times just so the girls could wave at me going put put to the beach…. Ernesto, I may forgive you eventually….. The girls are in on it too. “Daddy, would you be able to buy a bigger engine if we broke this one?” asks Hannah innocently . I am feeling ganged up on. Having seen a couple of these collapsible “unsinkable” boats and having been given very positive reviews, I am quite keen to explore either the 10 or 12ft variants as an option too. Very light and they fold flat to pack away. I have to admit, adding weight with a bigger dinghy to the davits worries me. We have issues trying to protect the dinghy from rubbing on the davits and the davits with the solar panels and current dinghy are very near to their max allowable weight as well. Ah well, for at least the next wee while, our dinghy will have to do. But if a good deal can be had and I can find something that my davits can take, we may just see something a little bigger appearing on the back of Skylark……. Kate, no problem! Davits are the arms that stick out at the back of the boat that we use to store a dinghy out of the water. All lifeboats on ferries are held on davits.